Kendra Foord is a Student Engagement Programmer at Conestoga College in Kitchener-Waterloo. Her combined BA in Anthropology and Women and Gender Studies has enabled her to pursue a career related to her interests in equity and social justice. After taking Anthropology 101 in my second year at Laurier, I knew I had found a major that I could happily pair with Women and Gender Studies. When I entered university I had hopes of pursuing a career in international development. However, after gaining more exposure to the subject, I decided there were other ways I could have a career related to my interests in social justice and equity. In my anthropology courses, I often found the opportunity to challenge Western notions charity and social justice and explore the many ways of seeking justice across a wide range of cultures. I began volunteering at Grand Valley Institution for Women during my first year of studies and gained invaluable experience that assisted me in securing positions working with people experiencing homelessness. Eventually, I became the manager of services at oneROOF Youth Services, an agency serving youth who are at risk or experiencing homelessness in Kitchener. While this organization and the youth it serves are still close to my heart, I decided to make a career change in 2015 and accepted a position with Conestoga College that involved facilitating a career preparation program. After a year in that role, I moved to my current position in the Department of Student Engagement. 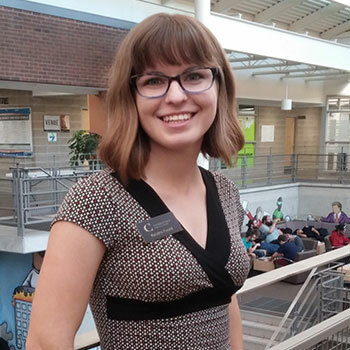 In my current role as a student engagement programmer, I connect students with opportunities to engage in meaningful learning experiences outside of the classroom such as workshops, volunteer opportunities, committee memberships and more. Part of my role involves planning and facilitating co-curricular learning opportunities for students that advance their understanding of principles of leadership, diversity, and inclusion. In this role I am always applying the knowledge that I gained as an anthropology major in the areas of cross-cultural communications, institutional culture and critical thinking. At each step of my career, I have found myself making good use of my degree in Anthropology and Women and Gender Studies. One of the reasons I was able to successfully acquire some of these positions was that I had a university degree in a social science field. I look back on my time as student fondly, and feel grateful that I had the opportunity to study Anthropology and Women and Gender Studies at Laurier.